SINGAPORE — The decision by Vietnam’s ruling Communist Party to endorse General Secretary Nguyen Pho Trong as the country’s next president is akin to China’s shift to centralized rule under Xi Jinping — albeit with more limitations. The presidency has been vacant since last month’s death of Tran Dai Quang, and Vietnam’s National Assembly is expected to rubber-stamp Trong as the replacement during a monthlong session starting on Oct. 22. The move would create a power structure unseen in Vietnam since 1960, when then President Ho Chi Minh gave up his position as party leader. “We won’t know if it is going to be permanent at this point,” said Huong Le Thu, an analyst at the Australian Strategic Policy Institute. “Depending how this pans out, it might set the argument for, or against, the permanent change,” she said, adding that the move could lead to better policy coordination. Like Xi in Vietnam’s giant northern neighbor, Trong has overseen an anti-corruption drive in a country ruled by a single Communist Party. “The comparisons are obvious, so are the inspirations, for centralization — although it remains with limits,” said Huong Le Thu. China and Vietnam are, however, at odds over the South China Sea, known as the East Sea in Vietnam. China’s expansive “nine-dash-line” claim to almost the entire water is in conflict with Vietnam’s claims to islands in the sea. The likelihood of Trong centralizing or personalizing power in Vietnam, to the extent Xi has in China, is limited by the mostly ceremonial role of the president, as well as the fact it is considered to be one the “four pillars” upon which the party’s leadership system rests. Trong, as president and party head, will stand atop two of the pillars, alongside Prime Minister Nguyen Xuan Phuc and Nguyen Thi Kim Ngan, the head of the national assembly. But as party chief, Trong already holds the most powerful position in the country. A low key leader, Trong is midway through his second five-year term as party boss. He was reappointed in early 2016 after winning a power struggle with former prime minister, Nguyen Tan Dung, who was seen as investor-friendly but was criticized for allowing corruption fester in state-owned enterprises. With Dung also perceived to be overly-ambitions, Trong’s diffident demeanor was said to heighten his appeal in the party. But that may also serve to prevent any Xi-style personalization of power in Vietnam. “He is by no means as charismatic and is unlikely to reach the position that Xi has,” said Huong Le Thu. Giang at the Vietnam Institute for Economic and Political Research said that the bigger question now is who will replace Trong in the next Congress in 2021, or whether he would try to stay in place after that. 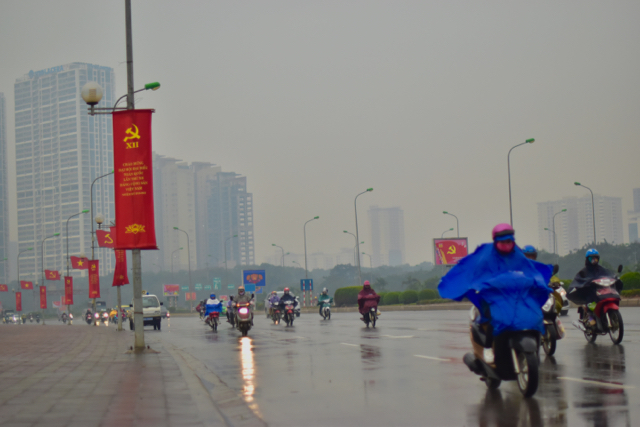 The installation of Trong as both party boss and president is unlikely to affect Vietnam’s system of communist political control over an increasingly open and growing market economy. World Bank data from last year showed Vietnam’s trade-to-GDP ratio exceeding 200%, putting it among the world’s most globalized countries. The economy is also projected to expand around 7% over this year and next. “I can’t see the current leadership change seriously disrupting structural reform in the domestic economy nor Vietnam’s efforts toward building bilateral and regional trade links,” said Suiwah Leung, an economics professor at the Australian National University. “The decidedly uncertain and possibly unfavorable developments in the global economy might even have been a factor in the decision to merge the two positions,” Leung added, in reference to the escalating trade dispute between China and the U.S.